Massachusetts was the first state to codify integration in schools. Following boycotts, lawsuits, and state legislation, the state Supreme Court ruled against segregation in Boston v. Roberts in 1855. This decision was referenced in Brown v. Board in 1954, a federal Supreme Court decision against de jure, or by law, desegregation. 20 years before the Boston v. Roberts decision, The Abiel Smith School opened in Boston as the first public primary school for black children in the United States. 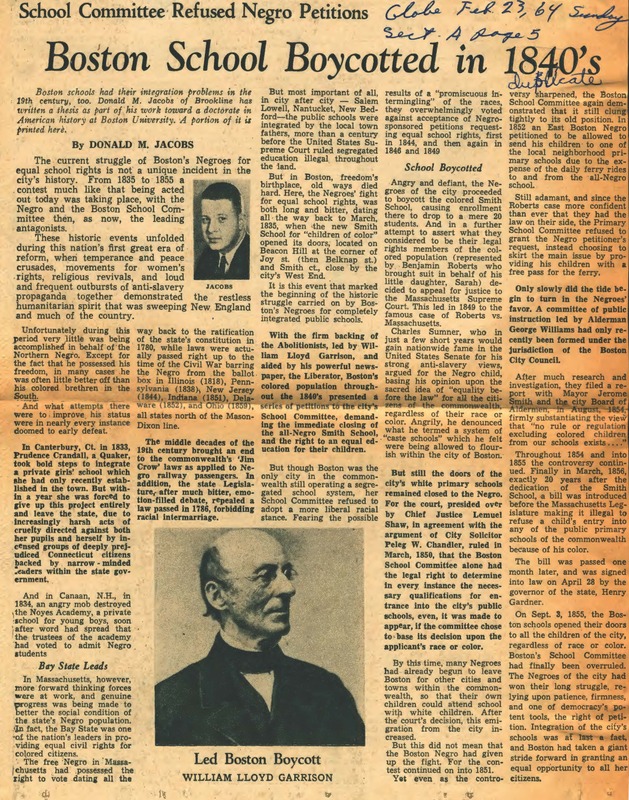 Leading up to the U.S. Civil War, Boston was a center of the northern and national Abolition movement, important thinkers such as William Lloyd Garrison, Wendell Phillips, and Lucy Stone lived in Boston, advancing the historical foundation for civil rights in the United States. Boston, with its dense university population, also led progressive educational reform. Horace Mann and other educational reformers helped Boston Public Schools become some of the best in the nation. This history was important to activists in the 1960s who were trying to fix the conditions in Boston schools. This article from the Boston Globe gives some of the history of activism and education reform in Boston in relation to growing concern about the state of schools in the early 1960s in Boston.